The Asiatic lion is a subspecies of the lion found in Senegal east to Somalia, East Africa, Angola, northern Namibia and from Kalahari east to Mozambique and northern Natal. Asiatic lions are generally smaller than African lions, and the most noticeable difference is the long fold of skin running along the Asiatic lion's belly that is rarely found on the African lion. Adults can reach up to eight feet in head and body length, their tails reaching up to three feet in length. Females are smaller than males. The males can weigh up to 550 lb and the females can weigh up to 400 lb. Their fur is tan in color and is a great camouflage in the light-colored savanna grasses. The mane of the males varies in color from light to dark brown or even black, and it is generally shorter than that of the African lion making their ears more visible. The Asiatic lion prefers grassy plains, savanna, and open woodlands as its habitat. Like African lions, they are very social and live in groups called "prides." Asiatic lion prides are smaller than African lion prides, and males prefer to associate with the pride when mating or during hunting. They are nocturnal creatures, and most of the day is spent resting. Asiatic lions prey on medium to large mammals, such as wildebeest, zebra, giraffes and gazelles, and young elephants, rhinos, and hippos. 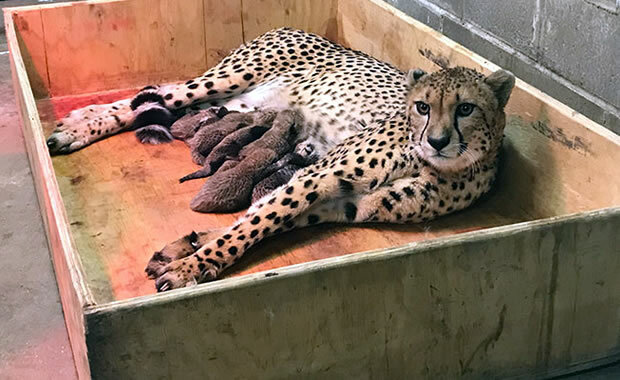 Breeding can occur year-round and females give birth to one to five cubs after a gestation period of 100 to 119 days. Asiatic lion populations have suffered due to sport hunting in the 1800s (until it was outlawed) and habitat loss due to the clearing of jungle forest for extracting wood and human settlement. The Gir, a national park and lion sanctuary has been successful in stabilizing one of the last remaining wild populations. Also, the species does well in captivity and some are found in zoos. Copyright Notice: This article is licensed under the GNU Free Documentation License. It uses material from the Wikipedia article "Asiatic lion". Glenn, C. R. 2006. 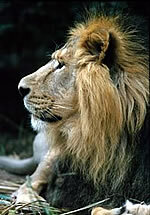 "Earth's Endangered Creatures - Asiatic Lion Facts" (Online). Accessed 4/23/2019 at http://earthsendangered.com/profile.asp?sp=239&ID=3. Need more Asiatic Lion facts?